HIALEAH, FL – The Florida National University Volleyball team (10-8) stopped their winning streak in a five-set loss, on Friday night, September 26th at Bucky Dent Gymnasium against Florida Memorial University. LOCATION: Bucky Dent Gymnasium | Hialeah, Fla. FOLLOW US: @FNUCONQUISTADORS on Facebook, Instagram and YouTube. SET 1 | FNU opened the first set with five unanswered points, including back-to-back service aces to pad the lead. St. Thomas came back to force a tie at 10-10, the first of 11 ties in the opening set. The Conquistadors (FNU) forced extra points in the first set against the Lions (FMU) as they dropped the set by a score of 26-24. SET 2 | FMU opened up the second set with a 10-2 run, which featured three straight service aces from Aryam Sammyra Albarran before FNU’s Coach Carlos Huaroto called their first timeout. The Lions opened up a 19-8 lead over the Conquistadors before FNU rallied for five consecutive points to cut the FMU lead. 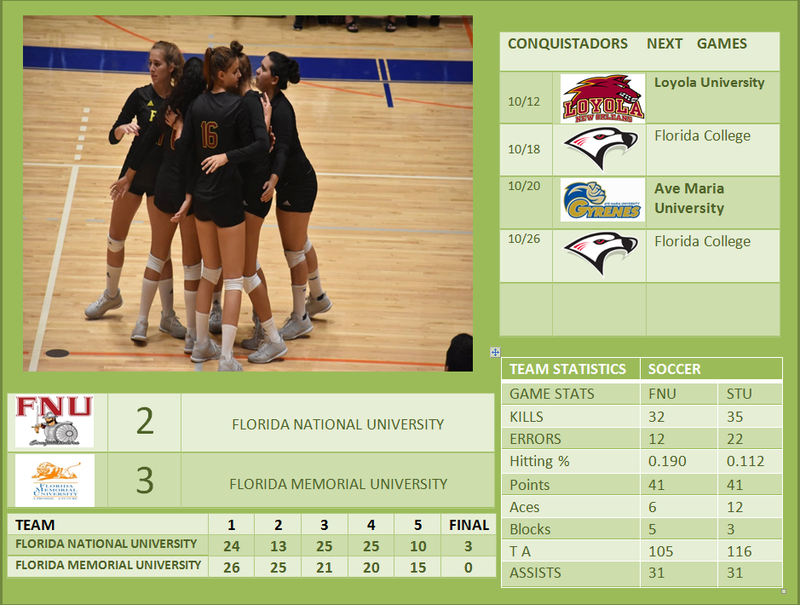 FMU closed the set with another run of three consecutive points to take the victory over FNU at 25-13. SET 3 | The third set of the match featured another close set as the clubs were unable to generate much separation between themselves as the largest lead was only a slight three-point advantage. FNU closed out the set with a 25-21 victory. SET 4 | The Conquistadors started amazing and opened up a 24-16 lead over the Lions before FMU rallied for five consecutive points to cut the FNU lead to three points. FNU closed out the set and the fourth with a 25-21 victory forcing the tie-brake Set. SET 5 | The Lions started strong and opened up a 3-0 lead over the Conquistadors before Ines Bawedin Score 2 Service aces. FMU kept the set Strong and closed out the set and the match with a 15-10 victory. Ines Bawedin led the Conquistadors with 19 kills. Camilla Kahlich Ines Bawedin added 14 kills while Maricielo Zuluaga had 12. Splitting time directing the offense, Carolina Dantas registered 46 assists and two server Ace. Wandy Cruz, Cinergi Rosas and Ines Bawedin had 31, 19 and 13 Digs respectively. The Conquistadors will have a tri-match on the road and will face Loyola University of New Orleans and Florida College on Saturday September 29th at 1:00 pm and 3:00 pm respectively.